Just like every state has different laws, different beaches have rules that you should know before you get there. These rules aim to keep all visitors as safe as possible and to protect these beaches. Visitors can typically find these rules by checking the beach town’s visitor webpage, posted signs, or asking lifeguards. Since every beach is different, we are going to discuss some of the specific rules of Wrightsville Beach. Some laws that particularly pertain to surfing are in place to protect not only surfers but the people around them. Leash Laws: On Wrightsville Beach all surfers must use a leash while surfing. (~$200 Fine) This is so that a loose board won’t hit someone and so that surfers won’t get caught in dangerous surf without a flotation device. No surfing within restricted zones: This is within 350 feet of the piers, 100 feet of the south end jetty, and inside guarded areas (checkered flags with a lifeguard stand in the middle, only when lifeguards are on duty). 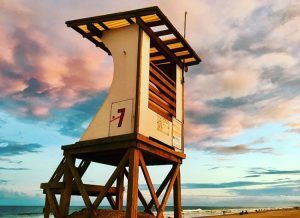 (~$250 Fine) This mostly protects the surfers from hitting structures but it also protects potential rescuers from dangerous situations and non-surfers from getting hit. Some examples are: no glass containers, fires, or cooking devices. No alcoholic beverages and no smoking. No Fireworks; most of these will end up in the water as litter and explosive fireworks are outlawed in North Carolina completely. 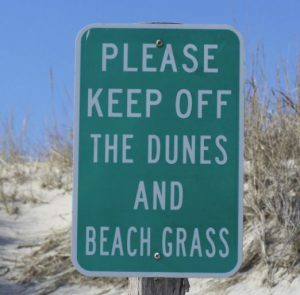 No unauthorized vehicles on the beach and keep off the dunes. What about the family pup? Wrightsville Beach allows animals on the beach on a leash from October 1st to March 31st but not during the summer months. So, when planning your trip the first step is to be aware of the local beach laws. Help keep our beaches clean and safe! Here is a link for a more in-depth look into WB laws. Some other things to consider when coming are what to actually bring. Now we know not to bring the beer cooler or the pup during the summer but what else should you bring? Bring only what you will use. Consider bringing an umbrella but also something to tie it down with. Bring toys but keep a close eye on them. Many families end up packing a lot of toys for the kids but, too often, a blow up inflatable flies out to sea or a toy shovel washes away. This turns into dangerous trash in the ocean for wildlife. Plan ahead and prepare and your family will have a fun, and safe, experience.